Johansson, G. (1975). "Visual motion perception." Scientific American. Aggarwal, J. K. and Q. Cai (1997). Human motion analysis: A review, IEEE. Moeslund, T. B. and E. Granum (2001). "A survey of computer vision-based human motion capture." Computer vision and image understanding 81(3): 231-268. Moeslund, T. B., A. Hilton, et al. (2006). "A survey of advances in vision-based human motion capture and analysis." Computer vision and image understanding 104(2): 90-126. Turaga, P., R. Chellappa, et al. (2008). "Machine recognition of human activities: A survey." Circuits and Systems for Video Technology, IEEE Transactions on 18(11): 1473-1488. Poppe, R. (2010). "A survey on vision-based human action recognition." Image and Vision Computing 28(6): 976-990. Aggarwal, J. and M. S. Ryoo (2011). "Human activity analysis: A review." ACM Computing Surveys (CSUR) 43(3): 16. Forsyth, D. A., O. Arikan, et al. (2006). Computational studies of human motion: Tracking and motion synthesis, Now Pub. Gavrila, D. M. (1999). "The visual analysis of human movement: A survey." Computer vision and image understanding 73(1): 82-98. 10. Ikizler-Cinbis, N., R. G. Cinbis, et al. (2009). Learning actions from the web, IEEE. 11. Gupta, S. and R. J. Mooney (2009). Using closed captions to train activity recognizers that improve video retrieval, IEEE. 12. Cour, T., C. Jordan, et al. (2008). Movie/script: Alignment and parsing of video and text transcription. 13. Duchenne, O., I. Laptev, et al. (2009). Automatic annotation of human actions in video, IEEE. 14. Laptev, I., M. Marszalek, et al. (2008). Learning realistic human actions from movies, IEEE. 15. Haritaoglu, I., D. Harwood, et al. (1998). "W 4 S: A real-time system for detecting and tracking people in 2 1/2D." Computer Vision—ECCV'98: 877-892. 16. Tao, D., X. Li, et al. (2006). Human carrying status in visual surveillance, IEEE. 17. Davis, J. W. and S. R. Taylor (2002). 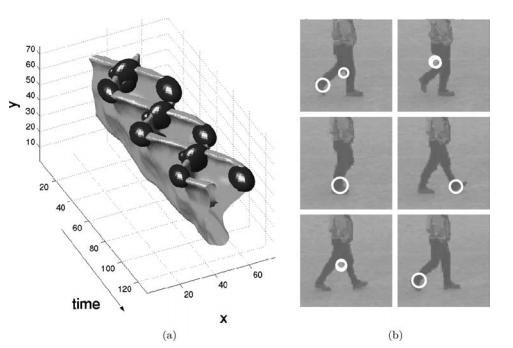 Analysis and recognition of walking movements, IEEE. 18. Lv, F., X. Song, et al. (2006). Left luggage detection using bayesian inference. 19. Auvinet, E., E. Grossmann, et al. (2006). Left-luggage detection using homographies and simple heuristics. 20. Bobick, A. F. and J. W. Davis (2001). "The recognition of human movement using temporal templates." Pattern Analysis and Machine Intelligence, IEEE Transactions on 23(3): 257-267. 21. Wang, Y., K. Huang, et al. (2007). Human activity recognition based on r transform, IEEE. 22. Chen, H. S., H. T. Chen, et al. (2006). Human action recognition using star skeleton, ACM. 23. Wang, L. and D. Suter (2006). 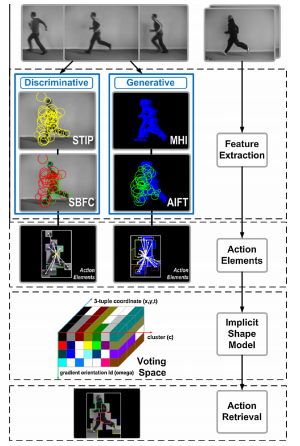 Informative shape representations for human action recognition, Ieee. 24. Weinland, D., E. Boyer, et al. (2007). 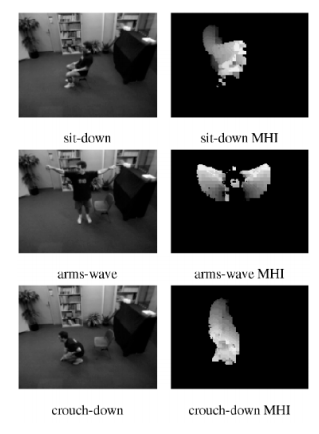 Action recognition from arbitrary views using 3d exemplars, IEEE. 25. Weinland, D. and E. Boyer (2008). Action recognition using exemplar-based embedding, Ieee. 26. Efros, A. A., A. C. Berg, et al. (2003). Recognizing action at a distance, IEEE. 27. Blank, M., L. Gorelick, et al. (2005). Actions as space-time shapes, IEEE. 28. Gorelick, L., M. Blank, et al. (2007). "Actions as space-time shapes." Pattern Analysis and Machine Intelligence, IEEE Transactions on 29(12): 2247-2253. 29. Achard, C., X. Qu, et al. (2008). "A novel approach for recognition of human actions with semi-global features." Machine Vision and Applications 19(1): 27-34. 30. Batra, D., T. Chen, et al. (2008). Space-time shapelets for action recognition, IEEE. 31. Yilmaz, A. and M. Shah (2008). "A differential geometric approach to representing the human actions." Computer vision and image understanding 109(3): 335-351. 32. Ke, Y., R. Sukthankar, et al. (2007). Spatio-temporal shape and flow correlation for action recognition, IEEE. 33. Laptev, I. (2005). "On space-time interest points." International journal of computer vision 64(2): 107-123. 34. Dollár, P., V. Rabaud, et al. (2005). Behavior recognition via sparse spatio-temporal features, IEEE. 35. Rapantzikos, K., Y. Avrithis, et al. (2007). Spatiotemporal saliency for event detection and representation in the 3D wavelet domain: potential in human action recognition, ACM. 36. Rapantzikos, K., Y. Avrithis, et al. (2009). Dense saliency-based spatiotemporal feature points for action recognition, Ieee. 37. Wong, S. F. and R. Cipolla (2007). Extracting spatiotemporal interest points using global information, IEEE. 38. Bregonzio, M., S. Gong, et al. (2009). Recognising action as clouds of space-time interest points, IEEE. 39. Bay, H., T. Tuytelaars, et al. (2006). "Surf: Speeded up robust features." Computer Vision–ECCV 2006: 404-417. 40. Willems, G., T. Tuytelaars, et al. (2008). "An efficient dense and scale-invariant spatio-temporal interest point detector." Computer Vision–ECCV 2008: 650-663. 41. Klaser, A. and M. Marszalek (2008). "A spatio-temporal descriptor based on 3D-gradients." 42. Mikolajczyk, K. and C. Schmid (2004). "Scale & affine invariant interest point detectors." International journal of computer vision 60(1): 63-86. 43. Scovanner, P., S. Ali, et al. (2007). A 3-dimensional sift descriptor and its application to action recognition, ACM. 44. Wang, H., M. M. Ullah, et al. (2009). "Evaluation of local spatio-temporal features for action recognition." 45. Niebles, J. C., H. Wang, et al. (2008). "Unsupervised learning of human action categories using spatial-temporal words." International journal of computer vision79(3): 299-318. 46. Schuldt, C., I. Laptev, et al. (2004). Recognizing human actions: A local SVM approach, IEEE. 47. Thi, T. H., L. Cheng, et al. (2011). "Integrating local action elements for action analysis." Computer vision and image understanding. 48. Liu, G., Z. Lin, et al. (2009). "Radon representation-based feature descriptor for texture classification." Image Processing, IEEE Transactions on 18(5): 921-928. 49. Carbonetto, P., G. Dorkó, et al. (2008). "Learning to recognize objects with little supervision." International journal of computer vision 77(1): 219-　237. 52. Rodriguez, M. D. (2008). "Action mach a spatio-temporal maximum average correlation height filter for action recognition." CVPR. 54. Marszalek, M., I. Laptev, et al. (2009). Actions in context, IEEE.